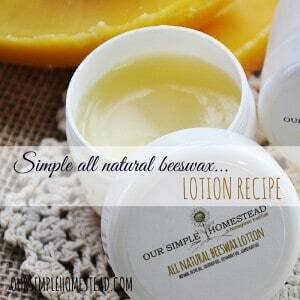 There are so many different all natural beeswax lotion recipes out there, it’s often hard to figure out which one is best. If you’re looking for a simple health and beauty recipe, that you can make quickly this is the one. This recipe only took me about 30 minutes to make and I was able to use whatever essential oil I had on hand. Today’s choice was grapefruit essential oil! Using a double boiler or heat-safe bowl place pint jar in the pot of simmering water. Melt beeswax, olive oil, and coconut oil until melted and blended. Remove from heat and cool for 15 minutes. 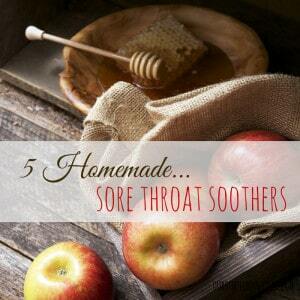 Add Vitamin E and your favorite essential oil. 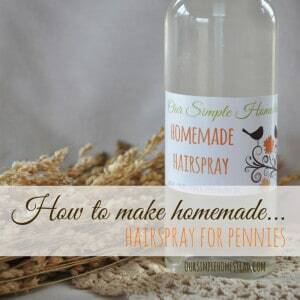 Stir until blended and pour into 2 oz containers or leave in a pint jar. Let cool until solid and cool to the touch. They are ready to use and share! I’m constantly reading your blog. Today I ventured out to sign up for Facebook. I’ve always stayed away from Facebook from all the negative things I’ve heard about it. But because I noticed you are on Facebook, I made the decision to sign up. I went to your posts and found the “Like” button and pushed some. I truly enjoy your posts, the information and DIY projects you share with us and of course all the pictures of your critters. 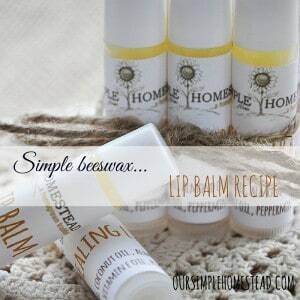 I just found your Simple Beeswax Lotion and want to try my hand at it. These would be super cute little gifts to share with my family and friends. Question: Where did you get your labels? I like how you have the label on top of the little jar. I will go to Amazon (from your link) and purchase the jars, but don’t see where you tell how to make the labels. I’m a complete dork when it comes to this computer, so I’m hoping you have a simple pattern or idea for me. Happy Day To You ~ I look forward to your reply. 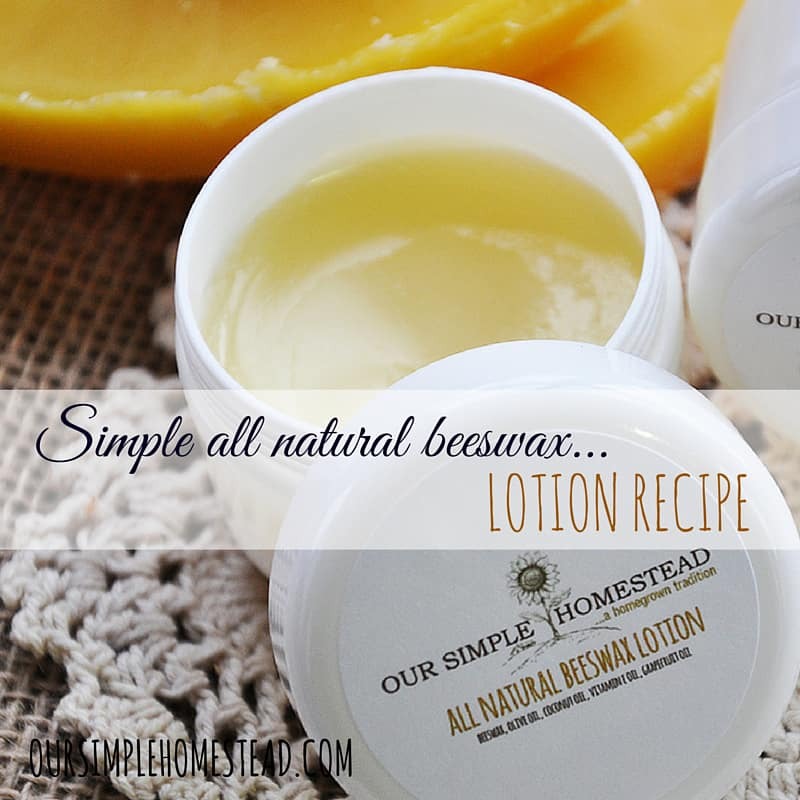 I am so happy you are enjoying reading through some of my posts…you will love the beeswax lotion! My skin gets so dry in the winter I can’t keep enough of it made. Facebook is good if you just follow your friends and if you don’t like the types of posts someone is sharing just unfollow them…if you keep that in mind you will find you like it. I used Avery Label #5293 to make my labels. I think I use Microsoft Publisher to put it together. I’m gonna make this lotion this week. I have everything but the Vitamin E. Thanks for the tutorial. Pinned!